Each month, the SANS Institute (sans.org) releases their OUCH! newsletter from their Securing the Human organization. These newsletters provide valuable information for users regarding securing their data/information. 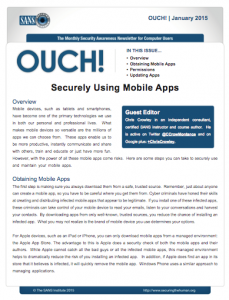 The January newsletter covers Securely using Mobile Apps. Click on the image below to read the current issue.